The Pittsburgh Penguins General Manager, Ray Shero, gets an adrenaline rush around the trade deadline. This time of year is like a holiday for Shero. He relishes the opportunity to improve his already exceptionally talented hockey club. With the deadline just around the corner, rumors have swirled about who may be coming to the Penguins and who may be going at the hands of Shero. One of Shero’s main concerns has to be the play of his defense. Shero and the Pens have not had to deal with as many injuries as they did last season. Despite less adversity, their defense has not played up to last year’s standard. The only accomplishment the Pens defense can hang their hats on is their penalty killing numbers. This season they have ranked in the top 3 for most of the season and are currently tied for second at 88.6%. Kris Letang and Brooks Orpik have been defensive anchors of the Pens for a few years, but they could improve their game in certain areas. Orpik has gotten beat on a few one-on-one occasions, and has had a tendency to give away passes breaking out of the defensive zone. 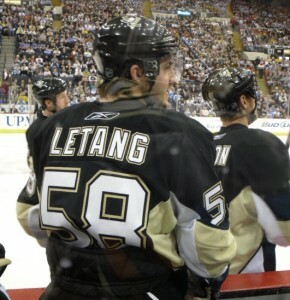 Letang can also be found guilty of forcing cross-ice passes or giving pucks away in his own zone at times. The 5-on-5 play of the defense is what is of most concern for the Penguins. This season they are ranked 13th in goals against average at 2.62 goals per game. The Pens have given up 118 even strength goals. This is ranked 23rd in the NHL. The plus/minus rating of Zbynek Michalek and Paul Martin is a -10 this season. This number looked even worse a few months ago. At the beginning of this season Martin and Michalek, the two highest paid defensemen on the team, looked like they had never played with one another. Martin should be the first to admit he has been lousy for most of the season. Although the $5.5 million defenseman has shouldered the majority of the Pens defensive woes, he is not solely responsible. The Pens, collectively as a defensive unit, have played substandard hockey. To blame Martin for the Pens bad defensive effort and pushing for him to be traded is unwarranted and unrealistic. His defensive partner, Michalek, is also guilty of not playing up to his expectations and knows that the pens defense has to better if they want to succeed. Michalek still supports Martin’s game despites the well-documented struggles of Michalek’s defensive partner. With there being some holes in the defensive armor of the Penguins Head Coach Dan Bylsma has experimented with different pairings of defenseman. 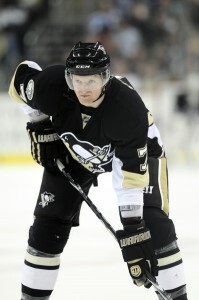 Coach Bylsma has shifted Martin around and, on Tuesday night against the New York Rangers, placed Martin with Letang. Bylsma was primarily forced to make this move due to Orpik being out of the lineup with an upper-body injury. Martin and Letang looked like they had played together growing up as mites. Their puck movement was smooth and crisp. The break out with those two players looked like a work of art. Martin was +1 and awarded 26:21 of ice time. He was outstanding and played his best game of the season. Letang was his usual consistent self, and led the Pens in ice time with 28:41. He posted an assist and was a +1 as the Pens shutout the best team in the Eastern Conference. This was the best game the Pens defense had played as a group all season. As much as the Penguins could use improved defensive play, and as much as Shero is itching to make a move before the trade deadline, the Pens may have their best team on the ice already. There is no enticing shutdown defenseman who would totally change the make-up of the Penguins like a Hal Gill. The defensemen of the Penguins still have not played consistent hockey yet this season. If Martin and Michalek start playing up to their full potential and the defense starts playing more consistent, there is no one on the trade market who is any better than what the Pens currently have on their roster at defense. Coach Bylsma stressed the importance consistency down the stretch. The only thing the Pens need to acquire at the trade deadline is constant brand of shutdown defense. The defense can’t be improved with the choices on the trade market. Martin and Michalek have been slowly shaping into form and we saw last season how they play when they are at their best. When they gain all of their confidence back, the Penguins will have two number one pairings on the blue line. The Pens defense will get a true test Saturday afternoon when they face Steven Stamkos and the Tampa Bay Lightning. Stamkos is tied with Evgeni Malkin for the league lead in points and is first in goal scoring. Stamkos has 11 point in his last four games.